Learn how light, color, texture, line, contrast and perspective help create the illusion of space—and more impactful works of art! Work individually at your own pace and on your own projects under the guidance of Shane McDonald, a painter with more than 25 years professional experience. 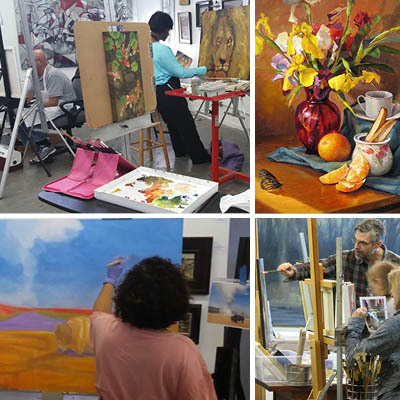 This class is ideal for students who have had some previous drawing or painting instruction and who want to improve their skills using oils, acrylics, pastels, charcoal, or just about any media they choose. Thursdays, 10 a.m - 1 p.m. Classes are ongoing, except that $120 pays for up to any 4 dates from the span above. Check the calendar link below to see when one-day workshops are scheduled. Students may take classes on both days of the week. While Shane provides instruction, mentoring, easels and small tables in the studio, prospective students are asked to bring their ideas, sketch or photo references, and art materials. Shane will explain and demonstrate exercises and techniques that will allow each student's personal style to come through their work. Shane begins class by walking from one student to another individually critiquing each student's progress on his or her project. 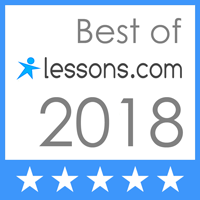 Each person receives instruction in the form of recommendations, encouraging comments, and answers to questions. Sometimes Shane will quickly sketch ideas for students who have trouble visualizing ways to solve artwork problems. If permission is granted by the student, Shane will also demonstrate techniques on the students' work. It's good to periodically change the working process—and when the class agrees as a group, a mini-workshop is scheduled to enable the mutual benefit of working together step-by-step on a similar project. Group instruction or demonstrations on certain topics pertinent to realistic representation are offered. On some days a portrait or figure model will be hired and students participate the entire session working from the model. A model fee will be requested for figure sessions. Anyone 13 or older who has previously taken a drawing or painting class with Shane or another instructor is eligible to participate. Since the class is limited to around 8 people, it is best to Email Shane McDonald to let him know you're interested in the class before you arrive or pay. You may also call or text him on his mobile at (404) 502-6829. Students are welcome to attend both Sunday and Thursday classes. Please attend all of the classes you pay for within the date range listed in the heading above. There will be no make-up classes or refunds. Each additional attended class beyond the first four will be $30. Email shane@shanemcdonaldstudios.com to reserve your spot starting on a specific date. In Shane's classes, the new students who are most attracted to details and who prefer to paint small (16 x 20 inches or smaller) will probably want to use oils. Students who are not sure what they like will probably feel a more immediate acquaintance with acrylics than with oils. Because of drying time constraints, students who use acrylics tend to use the paint more liberally and abundantly. Plus—it's great for traveling! A 11-3/4 X 15-3/4 inch sheet of glass puchased at a home improvement/hardware store fits well within a "Mastersons" plastic palette holder (protects the wet paint during transport). The edges of the glass should be taped and backed with heavy-duty masking tape to the edges of an equally-sized gray or neutral-colored matt board. The tints and shades of colors are usually easier to see on when not on white or black. The mat board also strengthens the glass to prevent breakage. Wooden palettes also work well because they tend to be lighter, but you'll want to use the pre-finished ones, otherwise, the wood will absorb the oil from your paint. ACRYLICS : A flat plastic, wood, or coated paper palette with a 12" X 16" area works fine. Brushes (Shane prefers long-bristled filberts and flats for oils and acrylics.) A selection of 4-5 Sizes should range from about 3/32 inch to about 1 inch (or more if you work large) If you work with thick paint application, you'll probably want stiffer bristles (which tend to be less expensive.) If you work in smaller details, you'll definitely want to spend a little more money on good softer animal-hair brushes. Although most students in Shane's classes paint, he believes that painting is an extension of drawing—only in color. Students who struggle with capturing the accurate representation of objects are encouraged to use traditional drawing media as much as possible. Pastellists should bring a complete set of at least 48 colors in medium-to-soft (non-oil-based) pastels. Some pastel pencils are also recommended. Contact Shane (Email) for more information on using pastels. The easiest and best way Shane can help you achieve your desired effect in painting is through the use of references. Still-life objects: If space permits, you may bring your own simple objects to paint in a quick still-life setup (which must be taken down at the end of class) or you may use my collection of still-life objects. Please be prepared to light your setup on your own. You may take digital reference images of the still-life at the end of class. Make it easy on yourself by keeping your supplies together. The use of inexpensive rolling travel bags work well for the transport of supplies. Non-painters: any container for storage of pencils, erasers, brushes, straight-edge, sharpener, etc. Painters: a tackle box or a small rolling suitcase that holds drawing materials, paints,gesso, brushes, painting medium, brush cleaner, and other small tools is ideal. Special Mini-workshop in Figure/Portrait Drawing coming in June! Draw figures with more accuracy by measuring reference points, negative space, and positive forms. Learn to draw figures and heads with a basic understanding of general proportions and shapes. Use charcoals to render figure gestures focusing on proportion, weight and movement. These offerings not a good fit? Try art instruction/classes by guest artists at Shane McDonald Studios in Artisan Resource Center Studio K2.